The late 60s and early 70s were a renaissance in toy manufacturing. Plastics technology, baby boomers, disposable income, and T.V. marketing set the stage for the toy explosion. 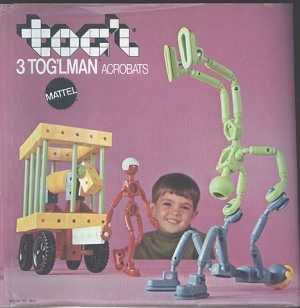 One of the most interesting toys born in this era was TOG�L. TOG�L was Mattel�s response to Lego, and in many ways took building blocks to the next level. Lego was essentially a static stacking toy. TOG�L offered several distinct advantages. First, blocks could be attached together on any of their six sides, allowing for horizontal construction. Even better, each block contained a "living action hinge" which meant each block had the ability to move built in. In addition to the basic building blocks, each set came with a variety of tubes, wheels, girders, panels and body parts. The larger sets also included one or more wind-up motors. Because TOG�L blocks were larger and easier to connect than Legos, they could be played with by a larger age group. The blocks originally came in five different sets, numbered 100 through 500, roughly reflecting the number of pieces in each set. These sets had printed cardboard tops and vacuum-formed bottom trays. Later sets were given names like "Busy Builder Set" and were packaged in cubic cardboard boxes. Each set came with instructions on how to build a variety of items, but creativity was encouraged. Late in the life of the line, playcases along with bagged and carded items allowed consumers to create their own sets from the pieces of their choice. Other additions to the line included tog�lmen, plastic-covered wire bendy figures and rubber band driven TOG�L trucks. Both the men and the trucks had connections to mate with the blocks. If the TOG�L line was weak in any area it was the ability of the blocks to stay tightly connected during play. Also, it was sometime difficult to place a block exactly. Panels had an even number of holes, for instance, preventing placement of a block in the exact center of a panel. An addition to later sets, the 2-to-1 connector helped somewhat. Alas, the TOG�L story is a short one. The toy was only marketed for four years, despite Mattel�s attempt to boost sales by repackaging and adding action figures and vehicles. Few intact sets survive today due to high small parts count and kid�s appetite for plastic chew toys.